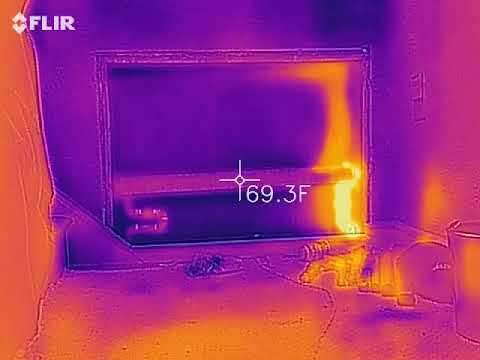 For your viewing enjoyment, a time lapse infrared video of a Trane Vapor system convector heating up. All of the other convectors on this system were of the internal orifice type. All except this one. This one had a Trane B-1 trap installed and had heated poorly for years. The supposition was that the internal orifice and the trap slowed the steam down. So the trap was removed and this video made. As you can see in the video, the convector allowed the steam to pass into the return piping at a pressure of about 2 oz/in2, so the conclusion was this convector had no orifice to speak of. The old trap was found to have failed in the almost closed position. It was determined that in order to match the heating rates of all of the other convectors, an orifice should be added to the supply pipe union. Most bellows radiator traps like Trane B-1, B-2, old Hoffman 8C etc will fail closed since the hydroformed bellows have a vacuum pulled on them to an internal stop when filled with the alcohol mix. When the magic juice is gone from internal the bellows relaxes to its natural state and will close off. We call those failed closed traps. Other disc type traps like most of Barnes & Jones, Mepco etc will fail open because there isn't as much flexure in the disc and their natural state is slightly relaxed so the trap will remain opne. You'll still get heat but it won't be as efficient. B&J made all different kinds, usually bellows were more expensive but could handle higher pressure and the bellows wouldn't work harden as quickly as the discs so they lasted longer. We could also calibrate each one to either fail open or close. We made a specific bellows industrial radiator trap for Bath Iron Works that they requested fail open. If it failed closed the coil would freeze. @hot rod , @Sailah Thank you for your comments! 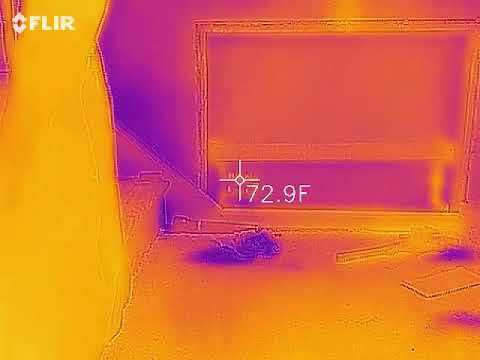 So we added an orifice in the 3/4" union on the steam supply to the convector and filmed the results. As you can see, our first try with an orifice the hole was a bit too small and restricted the steam too well. By this time the battery in the camera ran out, so we didn't get any videos of the final results. The very quick warm up of convectors makes me lean towards much smaller pick up factors for boilers with convectors, versus boilers with standing iron. Helps cut down on the short cycling of the boiler. Can slower warm up do slower cool down? @The Steam Whisperer (Formerly Boilerpro) : I do believe you are correct, sir. Empirical evidence has conclusively shown that to use traditional steam boiler sizing techniques for low-mass convector vapor heating systems is to indeed invite efficiency-degrading short cycling. @jumper: I don't think so. Convectors (the low mass fin-tube type anyway) cool off very quickly as soon as the steam stops flowing. Gordo, did you remove the trap guts? Is the inlet orifice sized to some % of convector EDR based on 2oz pressure? Any steam in the return then? @JUGHNE : We decided not to remove the trap guts but remove the trap entirely, so as not to put temptation in the path of someone in the future to rebuild the trap. The thought was that the convector should have had an orifice in it as all of the other convectors on site did. This one was definitely an outlier. So accordingly, in order to maintain system integrity and balance, we decided to add an orifice. We had charts to attempt proper orifice sizing to give us a starting point, but real world results over-ride the tables. Low mass convectors react differently from cast iron radiators, it seems. So you increased up from the charts a step or two? Perhaps with the speed of condensation because of the low mass it needed that much more flow and would still have kept steam out of the return. Well, the convector can heat up so quickly, that any steam not absorbed by the convector will quickly show up in the dry return, as shown in the first video of this thread. However, The charts we have were definitely for cast iron radiation and seemed way undersized, so there was a learning curve!